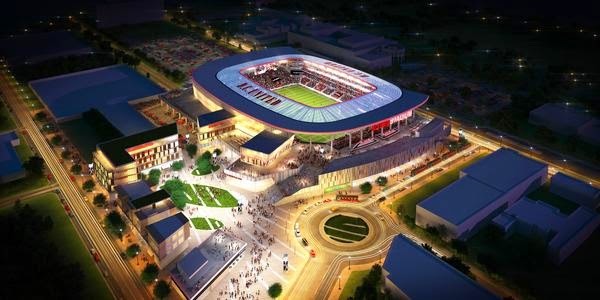 In one of his final acts before leaving office on January 2, Mayor Gray signed soccer stadium legislation into law yesterday, paving the way for a new stadium for DC United on Buzzard Point. The 20,000-seat stadium will be located at 2nd and R streets, next door to Fort McNair and about three blocks southwest of Nationals Park. The Supplemental Draft Environmental Impact Statement (SDEIS) for the South Capitol Street Project is now available and public comments can be submitted until February 2. A copy of the SDEIS is also available at the SW Branch Library. 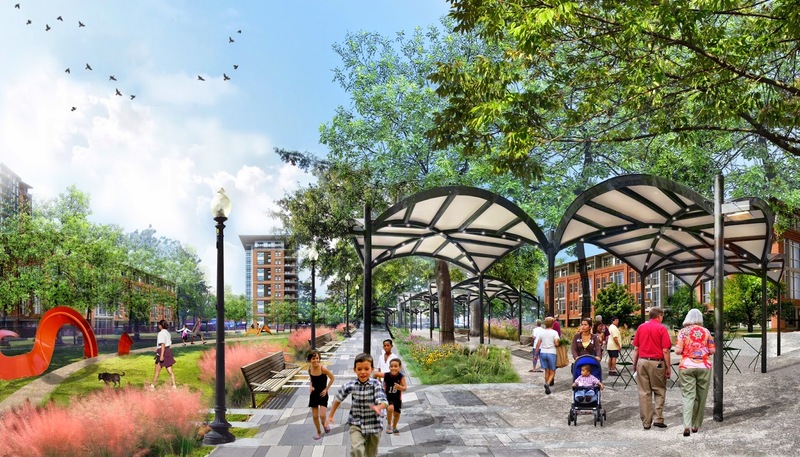 Check out JDLand for more details on the recent revisions proposed for the South Capitol Street corridor upgrade, including the reduction in size of the traffic oval planned on the west side of the Anacostia, changing the location of the replacement Frederick Douglass Bridge, and more. There will be a public hearing on January 22 from 6:30 – 8:30 pm at Mathews Memorial Baptist Church, Fellowship Hall located at 2616 Martin Luther King Jr, Avenue, SE. 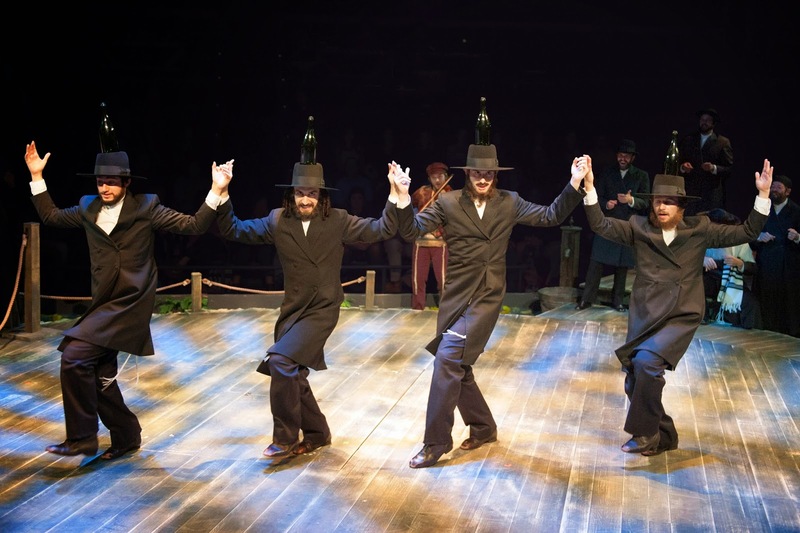 Arena Stage announced this week that Fiddler on the Roof has broken box office records for the SW-based theater. Previously, the record was held by the production of Oklahoma!, which was originally run in 2010 during Arena’s inaugural season back in Southwest and returned for a summer run in 2011. Fiddler’s run has been extended and will now end on January 11, 2015. Before the Christmas holiday, a topping off celebration was held at the Hyatt Place/Engine 13 firehouse under construction at 400 E Street. Construction began on the long-awaited project last December and was the subject of my very first post on this blog back in 2008. Delivery of the hotel/firehouse is scheduled for the fourth quarter of 2015. In attendance was Mayor-elect Muriel Bowser, who also announced that she has appointed outgoing Ward 6 Council member Tommy Wells as Director of the District Department of the Environment. A 2014 Year in Review will soon be posted. Happy New Year! 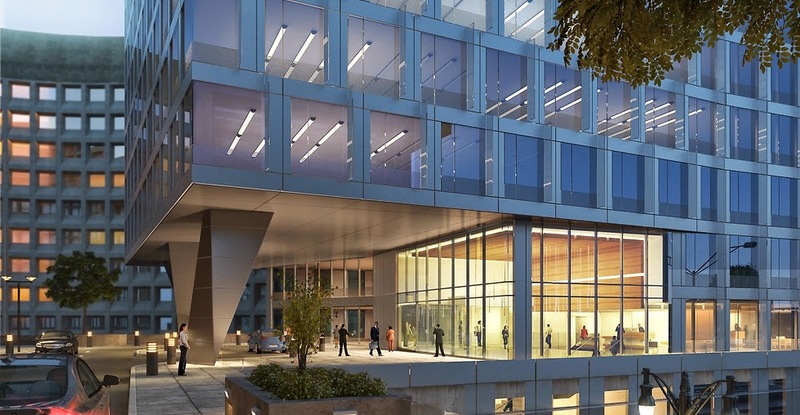 A little more than a month after representatives from Waterfront Associates gave an update on their planned residential building at Waterfront Station, the Washington Business Journal reports that a sheeting and shoring permit has been granted for 1001 4th Street. Construction fencing has not gone up yet, but with permits now in hand, fencing should be up soon; however, it is doubtful that actual construction will begin before the New Year since it's now only 10 days before the end of the year. 1001 4th Street was designed by Perkins Eastman and is planned as an 11-story, 365-unit rental apartment building with 5,000 square feet of ground floor retail along with multi-story residential units facing the private drive at the north end of the site and Makemie Place. It will take about 22 months to build the project, which means that the building should be complete around the fourth quarter of 2016. After this building, there is one more residential parcel planned at Waterfront Station, which is the District-owned parcel across the street. Sky House East began leasing early this year and the finishing touches are being placed on Sky House West. The two vacant parcels on the south side of Waterfront Station are slated to be office buildings, but there is no timetable on when those will be built. 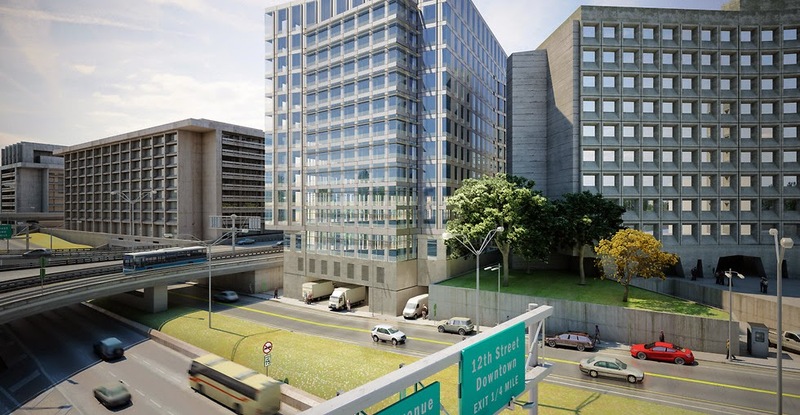 Demolition is underway along Frontage Road at L’Enfant Plaza to make way for 500 L’Enfant Plaza, a new, 220,000 square-foot trophy office building developed by The JBG Companies and designed by SmithGroup JJR. 500 L’Enfant Plaza has been designed for LEED-Gold certification and will include a green roof, triple-height lobby, and fitness center. 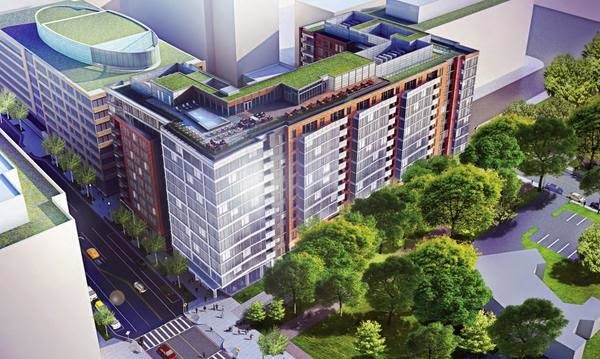 It will also have direct access to the revamped retail center and the L’Enfant Plaza Metro station. 500 L’Enfant Plaza is the latest component to L’Enfant Plaza, which has seen significant investment in recent years. A $12 million renovation to the common areas in the 955 L’Enfant Plaza office building was recently completed; the second phase of retail opened in stages this summer (the first retail phase opened in 2011); and the common areas of the 470/490 L’Enfant Plaza office building were renovated in 2012. Murals were painted by artists James Reka, SatOne, and Nawer on exterior walls along the L’Enfant Plaza Metro terrace and loading dock, as well as in the dining area. These murals are part of the JBG Mural Project designed to transform urban walls into public art and was curated by ArtWhino. There’s also the possibility that the International Spy Museum may relocate to the mixed-use complex, bringing more weekend activity to the retailers. However, it appears that the Homewood Suites extended-stay hotel that was planned for D Street has been scrapped for now. Another office building may eventually be built in the plaza itself. In addition, the L’Enfant Plaza Hotel was purchased by an affiliate of Sanford Hotels Group and is undergoing a complete renovation. The DC Council unanimously approved the District of Columbia Soccer Stadium Act of 2014 on second reading earlier today, which sets things in motion toward building a new stadium for DC United at 2nd and R streets on Buzzard Point. If things go as planned, the stadium will begin construction before the end of 2015 and will open in time for the 2017 MLS season. The city will use a combination of borrowing and a land swap to pay for its portion of the stadium, which covers land acquisition, environmental remediation and infrastructure improvements. One obstacle that is still left is how the city will acquire a two-acre parcel in the stadium footprint owned by Akridge. Since the land swap for the Reeves Center has been removed from the legislation, the city will need to purchase the parcel, by eminent domain if necessary. The road leading to this vote was a long one. Chatter about DC United’s interest in Buzzard Point first surfaced during the Great Recession in 2009, after plans to build a stadium at Poplar Point fell apart. DC United has been looking for a new home; the team currently plays at RFK Stadium, an aging multipurpose venue that lacks the intimacy or upgrades that are found in modern soccer-specific stadiums. Akridge’s 100 V Street parcel was eyed as a potential stadium location. At the time, Akridge was marketing the nine-acre site as a secure office complex for a federal tenant, but there was little interest from office tenants. Then in 2011, a land swap was proposed with Akridge, but not for a soccer stadium – it was to swap land in Hill East that houses the DC Jail for the 100 V Street parcel to build a new jail; however, this proposal never moved beyond the discussion phase. Several sites around the city were considered by DC United for the stadium, but ultimately Buzzard Point won out. Mayor Gray and DC United team owner Jason Levien signed a term sheet in July of 2013 to locate a new, 20,000-seat stadium on a portion of the 100 V Street parcel on Buzzard Point. Other landowners in the stadium footprint include Pepco, Super Salvage, and Washington Kastles owner Mark Ein. In the agreement, the city would contribute about $150 million for land acquisition and infrastructure improvements while the team would pay $150 million to build the stadium. In addition to the stadium, the team plans to eventually build a hotel and some retail space within the stadium footprint. Legislation was introduced to the Council last spring and a series of hearings were held over the summer and early fall. Some components of the deal announced last year have changed, including the Reeves Center land swap and some of the tax incentives offered to the team, but most of the deal’s original terms have remained intact. A Community Benefits Agreement (CBA) was added to the Council legislation at the behest of the CBCC and other local organizations, which includes restoration of Circulator service with an extension to Buzzard Point; funding for improvements to Randall Recreation Center; and a workforce intermediary to connect ANC 6D residents with stadium-related jobs. A separate CBA will be signed with DC United. This largely industrial section of Southwest will likely be transformed as a result of the stadium. An Urban Design Framework draft for Buzzard Point released by the Office of Planning over the summer will inform and guide public and private development decisions in the area for the next 10 years. The new stadium’s location, less than three blocks southwest of Nationals Park, will facilitate the creation of a stadium district in the area, since Potomac Avenue will link the stadia. There is the potential for over 10 million square feet of development on Buzzard Point, including up to 4,000 residential units, a maritime museum, marinas, and an esplanade along the Anacostia River. Next up: DC United will need to go before the Zoning Commission in 2015 to get approval for the stadium’s design. Vamos United! The Plan makes no land use change recommendations for the townhomes adjacent to Waterside Towers along Maine Avenue. The SW branch library should remain in its current site, but in a new facility. There was a proposal by DMPED and DCPL over the summer to move the library to a site owned by the District at Waterfront Station as a mixed-use development. That proposal will not be moving forward. A zoning change is not recommended for the Southeastern University campus site at 6th and I streets. However, Shakespeare Theatre Company will need a zoning change in order to move forward with its plans for the site. It can pursue a land use change through the Comprehensive Plan Amendment process that will be underway in 2015. Support the responsible redevelopment of the Greenleaf complex to benefit existing residents and realize a well-designed development and mixed-income community. Update public realm and transit infrastructure to enhance accessibility for all. Promote healthy living and food access for the entire community. Celebrate the distinctive character of Southwest and promote preservation of its outstanding Modernist architecture, landscape architecture, and urban design. 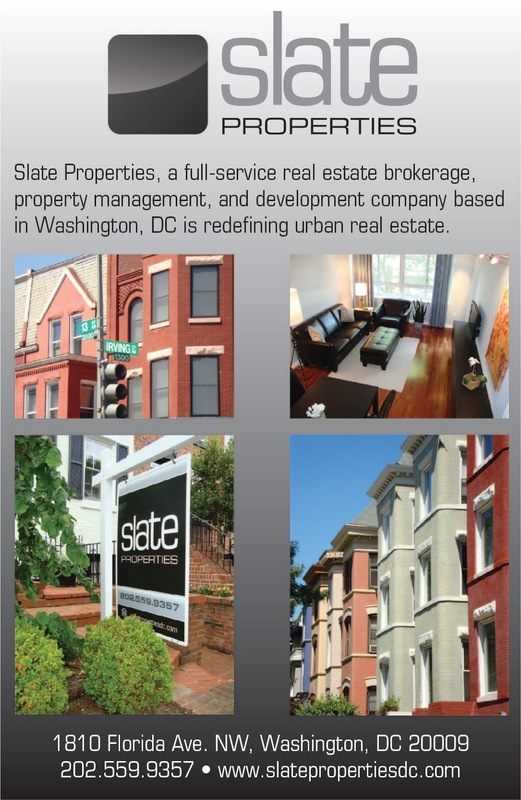 Retain and enhance the character of the L’Enfant Plan in Southwest including associated vistas and reservations. Ensure that future development is compatible with the existing design of the community. Construction fencing and equipment have appeared this week around Randall Park adjacent to Randall Recreation Center on I Street, which means the start of long-awaited improvements to the park should be imminent. Randall Park is one of the playgrounds slated for improvements as a part of the PlayDC initiative. The project has been delayed for over a year, first due to a proposal to build a charter high school on the site, then funding issues. Eventually, over $1 million was secured to fund the renovations. Originally, the scope of improvements was to be more comprehensive, including: new playground equipment for all ages, renovation of the existing basketball/tennis courts, removal of asphalt and brick walls and installation of a new splash park and seating areas in the plaza area fronting I Street, a skate park, walking path, adult exercise equipment, drinking fountains, picnic & game tables, security lighting, fencing, landscaping and gates. There was an objection by the developers of the adjacent Randall School project to the placement of the skate park, which would have been located next to the eastern portion of their site. 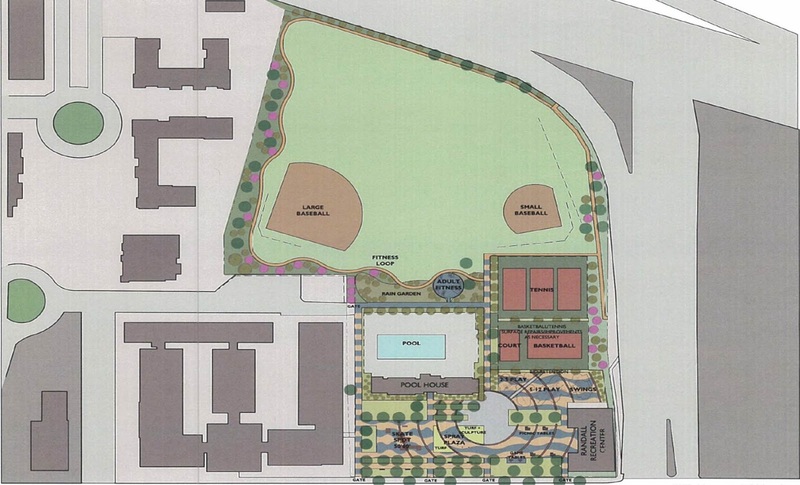 Subsequently, the Department of General Services determined that there was not enough funding to do all of the renovations in one phase, so the skate and splash parks, walking path, and adult exercise equipment will not be completed during this phase. The asphalt plaza fronting I Street will still be removed, but for now it will become a grassy area. In addition to the park improvements, $250,000 has been set aside in the FY 2015 budget to renovate the historic recreation center building, due to the Community Benefits Agreement included in the DC United soccer stadium legislation passed by the DC Council last week. Programming will also be extended for Randall, which was set to lose funding at the end of FY 2015. Park improvements should be completed by next spring. The process of creating a Business Improvement District (BID) for Southwest has been a long one, but one of the final steps will be taken today. A public hearing is scheduled with the Department of Small & Local Business Development (DSLBD) at the Wilson Building downtown. If the DSLBD determines that the SWBID should be created, it will make a recommendation to the Office of the Mayor, who will register the BID. The DC Council approved legislation over the summer to amend the BID Act to create SWBID and DSLBD approval is the other component needed for the BID to be formed. A representative from ANC 6D will testify at the hearing to express the commissioners’ unanimous support for the creation of SWBID. 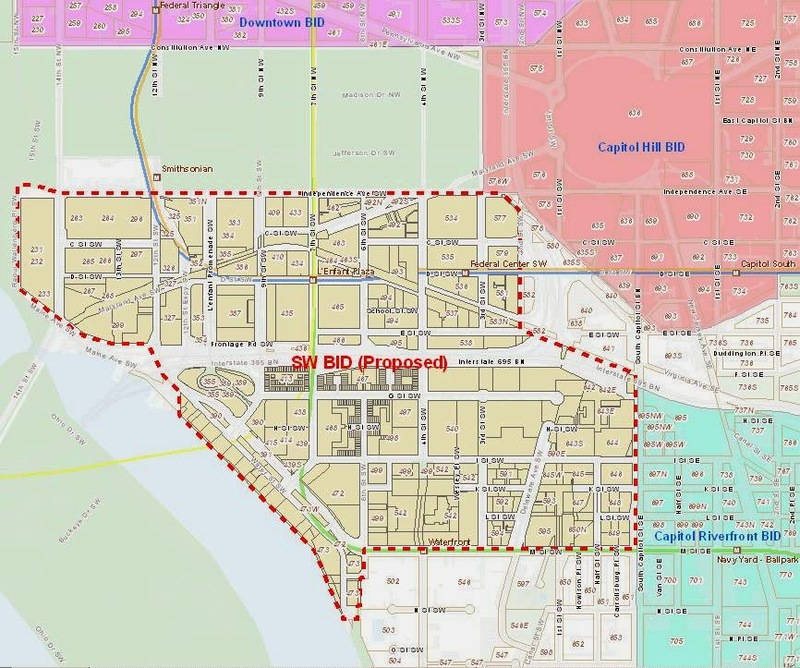 SWBID covers a wide area of Southwest, from south of the National Mall to M Street and from 15th Street to South Capitol Street. Excluded from the SWBID is the Portals complex, which resisted joining since several of the functions of a BID are already done by the property owners. There are three main areas of Southwest included in the BID and each has distinct needs. Along 4th Street near the Waterfront Metro, the BID will work to promote the street as the ‘Main Street’ of Southwest and attract retailers to vacant spaces along the corridor. In addition, the underpasses beneath I-395 will receive more attention and the BID will identify how to implement components of the SW Neighborhood Plan. Meanwhile, the BID will work on branding of The Wharf and improve transportation access to the area. Along 10th Street in Federal Triangle South, activation of the street is needed. At 7th Street and Maryland Avenue near L’Enfant Plaza, the BID will bring in playful street furniture to activate the area for office workers during lunch hour when food trucks visit. A taskforce comprised of PN Hoffman, Clark Enterprises, City Partners, and Forest City helped bring the BID to fruition. Other advisory members include GSA, SWNA, and ANC 6D, among others. A Board of Directors will be elected next year with somewhere between 10 and 15 members. While GSA cannot formally become a member of SWBID, the Federal agency has 13 buildings within the BID boundaries and will contract services for those properties. This arrangement is similar to what has been done in the Downtown DC BID. In order to fund the BID, there will be four classes of membership, each with their own set of fees: commercial property, industrial or unimproved land, hotels, and residential. The residential class includes rental apartment buildings with 10 units or more and the BID fee will be sent to the owners of the buildings. Condominiums, co-ops, town homes, public housing, and apartment buildings with less than 10 units are exempt, but will have the opportunity to opt-in if they want. It is anticipated that SWBID will send out the first bills in early 2015 and operations will begin in the spring; the BID is already looking for office space in the area. SWBID will be fully operational by next fall. The annual Parade of Lights will return to the Southwest Waterfront this Saturday. This year, the event will be held at Water Street Park/Gangplank Park (600 Water Street) starting at 6pm. The annual event includes the lighting of the Southwest Christmas Tree, photos with Santa, a bonfire, s’mores making, and live jazz. Houseboats and other vessels will be decorated for the holidays and will parade along the Washington Channel between Old Town Alexandria and Southwest starting around 7pm with the winners announced at 7:45pm. At yesterday’s legislative meeting, the DC Council unanimously approved the DC United stadium deal, although a second reading of the bill is scheduled in two weeks for final passage. If the bill receives final passage and is signed by the Mayor (the latter is uncertain due to issues with the funding scheme devised by the Council), it will allow the city to move forward with purchasing land to build a $300 million, 20,000-seat stadium at 2nd and R streets on Buzzard Point. The city’s contribution would be capped at $150 million. The stadium could open in time for the 2017 MLS season if all goes well, but there are still several hurdles left before we see fans walking down Potomac Avenue. Included in the legislation is a method to pay for the stadium, which Council Chair Phil Mendelson stated from the dais that Mayor Gray had not provided when he submitted the legislation back in May. After the Council removed the Reeves Center land swap from the deal, a roughly $62 million funding gap emerged since proceeds from the swap would have contributed to land assembly costs. Now, the city will need to purchase a two-acre parcel on Buzzard Point from Akridge either outright or by eminent domain, in addition to the land purchases already agreed to for other parcels in the stadium footprint (a land swap with Pepco will still proceed). Also included in the bill are community benefits specific to the area near the proposed stadium, negotiated between the Council and the CBCC, a member of the Winning Goal Coalition. 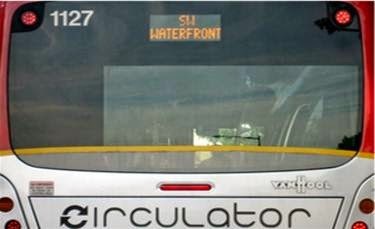 For instance, $4.9 million in operating dollars from the FY 2015 budget will be provided to restore the Convention Center – Southwest Waterfront Circulator route (earlier than the FY 2020 estimate in DDOT’s DC Circulator Transit Development Plan), but the route will be extended south into Buzzard Point. Funding was already in place to extend the Navy Yard – Union Station route into Southwest in FY 2015. Although streetcar routes are planned to eventually serve Buzzard Point, the Circulator will bring transit to the area sooner and funding for expanding the streetcar network are in limbo. The city will also provide $121,000 for a workforce intermediary to connect residents of ANC 6D with employment opportunities during construction of the stadium and for the first two years of operations. In addition, $250,000 will be provided to renovate the Randall Recreation Center building and provide programming beyond 2015 since funding was set to run out for programming on September 30, 2015. Ward 6 Council member Tommy Wells also expressed his commitment to preserve the mix of affordable housing in the area near the stadium and if any redevelopment of those communities were to proceed, a "one-to-one" replacement of the affordable units should be achieved. Additional community benefits are still being negotiated separately with DC United which may include summer jobs for local youth, United Soccer Club programming at local schools, scholarships for soccer day camps, free tickets for local youth, meeting space and use of the stadium for community events, among other things. While it appears that Akridge got the raw end of the deal by not getting the Reeves Center in the land swap, most of the news yesterday was good for the developer, which might help the city get the Buzzard Point land without the need for eminent domain. Akridge will likely get more money for the Buzzard Point land than it would have received in the land swap, since the price per square foot that Pepco and Super Salvage have agreed to receive for their parcels is higher than the previously agreed amount between the city and Akridge during the land swap negotiations. After Akridge sells its two-acre parcel for the stadium, it will still have seven acres just to the south of the new stadium. At one point, the 100 V Street parcel was planned as a 2.7 million SF secure office enclave to entice a federal agency; however, with a soccer stadium adjacent, those plans have likely changed (and if they haven’t they should!). There have been rumors that at least multifamily and hotel uses are being planned for the site, but Akridge has not made their intentions public yet. The H Street streetcar line can extend west past Union Station and go all the way to Georgetown. Amtrak can increase rail service (whose trains run below the bridge) and expand Union Station. The placement of the columns on the current bridge is preventing Amtrak from moving forward with its expansion. A multi-block air-rights development behind Union Station called Burnham Place can move forward, which is being developed by Akridge. On the same day that the soccer stadium deal was approved, a separate deal was approved by the Council for Akridge to renovate the historic Stevens School in the West End for a special needs school and will allow the developer to build an office building on adjacent land. 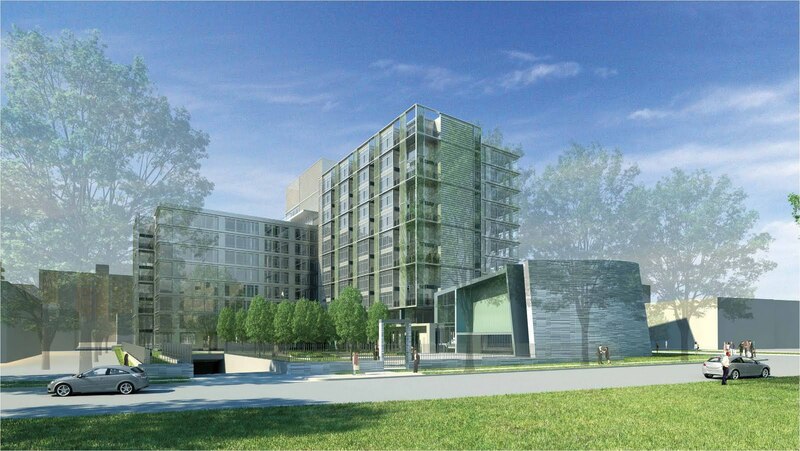 With the Reeves Center swap out, the proposed Anacostia Reeves Center complex is also on hold. 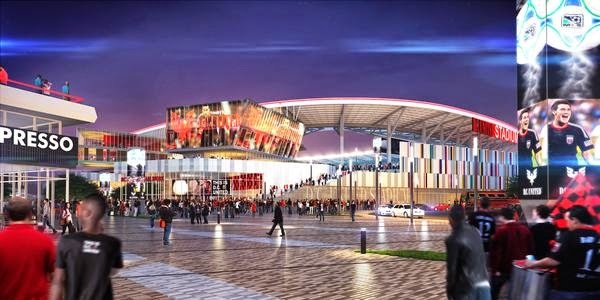 As Council Chair Mendelson put it, the city may choose at some point to sell the Reeves Center on the open market and use the proceeds to build a new municipal complex in Anacostia; however, it will not be included in the DC United stadium deal. The second vote on the stadium deal will be on December 16, the last legislative session of 2014 for the Council. The DC Council will be taking their first vote today on legislation to approve construction of a new stadium for DC United at First and R streets on Buzzard Point, also known as the District of Columbia Soccer Stadium Development Act of 2014. The proposed legislation has changed from the Mayor’s proposal such as the removal of the Reeves Center land swap. In order to make up for the proceeds that would have been gained from the land swap with Akridge, the city will need to borrow about $62 million out of $150 million to pay for land acquisition. The legislation will also permit the use of eminent domain if necessary to purchase the Buzzard Point land. The WaPo also states that a proposed sales tax abatement of $7 million for the team has also been scrapped. Meanwhile, the CBCC continues to work on including a Community Benefits Agreement (CBA) for those living closest to the stadium site in the legislation, although the final asks will likely be scaled back from their draft CBA. The group has been meeting with representatives from DC United and Council members to work on which components of the CBA can be included. Today’s Committee of the Whole meeting will be held today at 10am at the Wilson Building and the legislation meeting will be at 11am. Watch the meetings live. 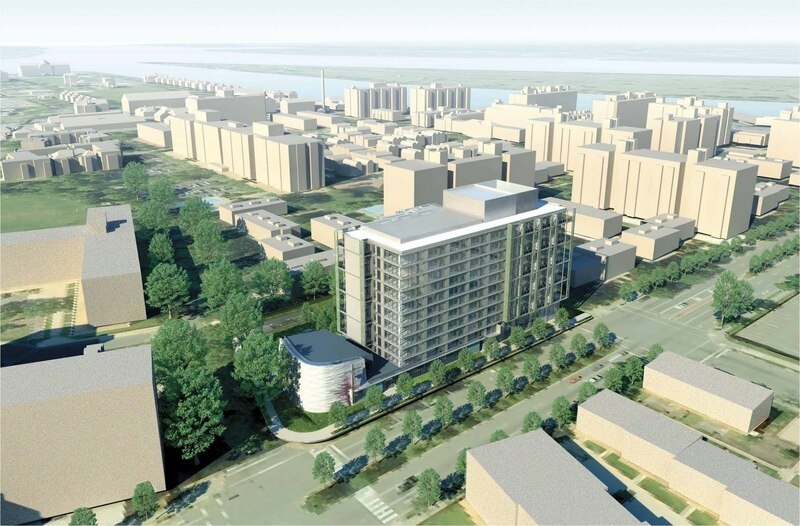 On a related note, the Southwest Neighborhood Assembly will host a panel discussion this evening on Buzzard Point development and preservation. Moderating the panel will be former ANC 6D commissioner David Garber. According to Hill Now, panelists will include ANC 6D commissioner Rhonda Hamilton, founder of Dupont Underground Julian Hunt, director of the Anacostia Watershed Society Jim Foster and historian Hayden Wetzel. The meeting will be held at MPD’s First District headquarters at 101 M Street, starting at 6:30pm.